If there is one things I have learned as a mom of four boys is that my guys love dinosaurs and vehicles. Basically, anything that goes vroom or roar. They have had their share of toys but nothing that combines two of their favorites. Until now. 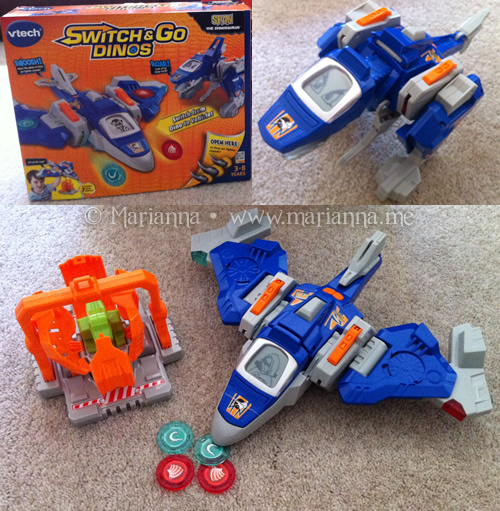 VTech Switch & Go Dinos are one of the coolest toys this mom has seen in some time. "Switch & Go Dinos features an entire line of seven durable, unique and collectable dinosaur toys. Each toy transforms from a dinosaur to a vehicle and back again in a few simple steps, providing two dynamic toys for the price of one. Each Switch & Go Dino comes equipped with a customizable LCD screen and voices vehicle sound effects and educational dinosaur facts. " From the moment these toys arrived in my house, the boys couldn't wait to rip open the boxes. I endured an entire day of "Can we pleeeeease open them now?!" - mostly from the seven year old. The first thing that I liked was that there was very minimal assembly required. A few pieces to snap on and that was it - they were ready to go! We started off with Span the Spinosaurus™, which starts as a plane and transforms into a dinosaur and then back again. Span also comes with a crate and a small baby dinosaur then can be attached to a hook on the bottom of the plane. These toys are unique not only in the fact that they transform, but they have electronic features. When you are in plane mode, you can choose from four different animated pilot faces to appear on the LCD screen and as you pretend to fly around the room, the sensors pick up the movement and you hear plane sound effects. Then once in dinosaur mode, you can select one of four faces and Span will share some of his dinosaur facts and jokes with you. Next up was Brok the Brachiosaurus™, which is the largest of the Switch & Go Dinos. Brok starts off as a big car with a smaller race car that launches a flying dinosaur when sent down his ramp. As with all of the Switch & Go Dinos, the LCD screen let's you choose from pilot faces in vehicle mode and dinosaur faces in dino mode. In seven fairly easy steps, Brok transforms into a Brachiosaurus dinosaur. What makes him really special is that in addition to his LCD screen and voice, Brok also features a moving mechanical neck as well as a light on top of his head. We have had our Switch & Go Dinosaurs for well over a week now and the boys are enthralled with them. It has created sum fun imaginative playtime between brothers as they have the dinosaurs interact with each other. Personally, I love how easy it is for them to transform the toys all by themselves. 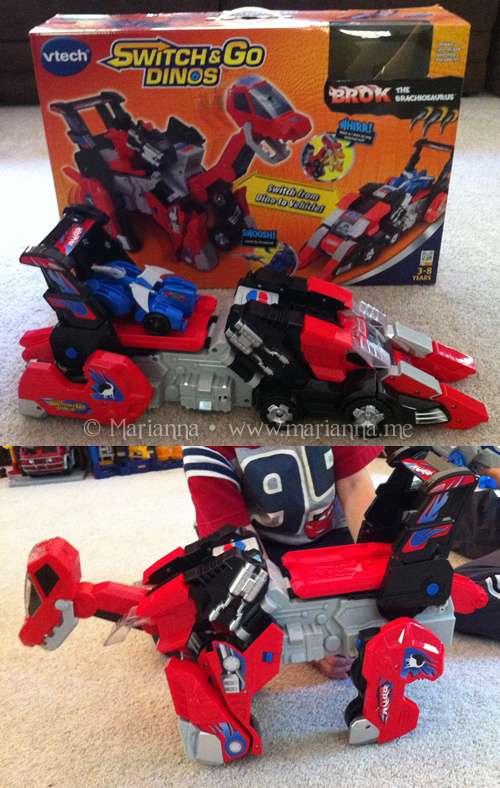 We have had a few other transforming toys in our house, all of which require myself or my husband to do it for the kids. After making a toy go from robot to car and back again 15 times a day, it makes we want to throw the toy against the wall. That is far from the case with the Switch & Go Dinos. I showed the boys the first time how to switch them and they were able to do it all on their own after that. Which also makes them quite proud of themselves. With the holiday season on its way (ack! 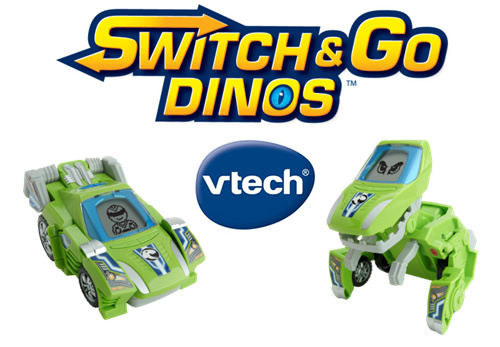 ), VTech Switch & Go Dinos are a fun, interactive toy that would make a great gift. From August 22 through October 1, visit www.facebook.com/vtechtoys to enter and upload a 30 second video of your child's home-made Dino creation. They can show their new Dino by drawing, building or customizing their existing Switch & Go Dino. View and share your favorite video entries with your friends and family. From October 8 through October 19 check out the top 10 to cast your vote for the coolest, most creative and fiercest video! Everyone who votes may be entered into a sweepstakes for the chance to win one of 25 sets of Sliver, T-Don, Horns and Tonn. One grand prize winner will get a kid's lifetime supply of VTech toys, plus a chance to see your video air in a VTech commercial on Nickelodeon, which you can watch at your very own viewing party with friends and family. VTech will also transform your living room into the ultimate Dino den! I participated in a campaign on behalf of Mom Central Consulting for VTech. 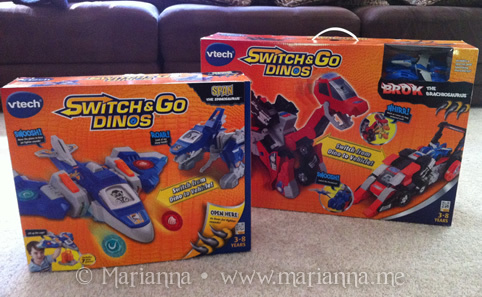 I received VTech Switch & Go Dinos product samples to facilitate my review. Wow, thanks for the review. My kid has been asking for these dinos and I was looking for more information. Your blog hit the mark. Thanks again!